The Ronda style as it is known originated by accident in Ronda’s Philip II’s Centre for Horsemanship when a gentleman training on horse was unseated in the path of a bull they used to train officers in horsemanship. 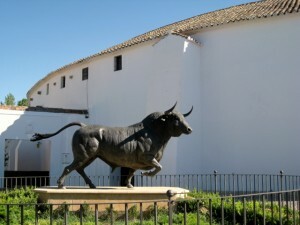 A local man, Francisco Romero distracted the bull on foot using his hat, thus securing both the life of the aristocrat, and inventing a new form of bullfighting perfected by his grandson, Pedro Romero (1754-1839). 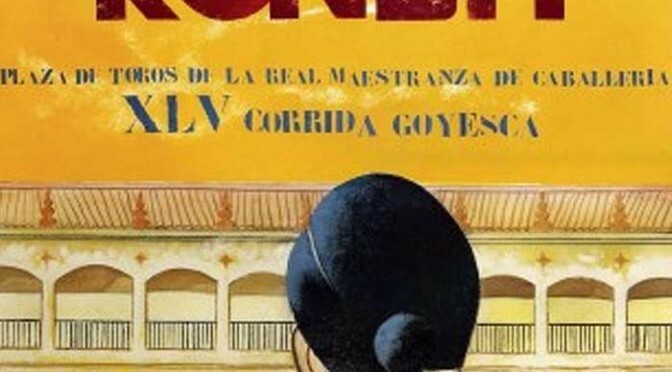 Love it or hate it, Pedro Romero turned bullfighting into a dance, and a form of entertainment that requires fitness, perfect balance, and tests a man in ways that the safer horseback style doesn’t. Pedro developed the red cape (the muleto) and a variety of moves to create a spectacle. Interestingly, a lot of people seem to think that the Ronda style of bullfighting is a uniquely Iberian invention of the last couple of centuries, which spread to Central and South American colonies with the conquistadors, in fact fighting bulls has been a rite of passage for young men throughout the Celtic world in pre-Roman times. After the collapse of the Roman Empire the sport became more established by Visigothic society and rules developed that needed to be followed for a young boy to graduate to manhood. Whilst these traditions have been forgotten, they are no less true for it. The Arab invaders of Iberia prided themselves on the horsemanship skills and adopted bullfighting as a spectacle in the same way that jousting became a spectacle in medieval times. Moorish bullfighting developed into the modern Sevilla style of bullfighting. Modern Ronda bullfighting pioneered by Francisco Romero, further developed by his son Juan, and perfected by his grandson Pedro involves a matador who is the real hero of the event, and a team of helpers (the cuadrilla) who tire the bull and direct it to the matador and his cape. The bull is first goaded and chased by the cuadrilla, then our matador uses his estoque to sever the bulls spinal cord. The final kill is done by another assistant, the cachetero, using a short dagger.